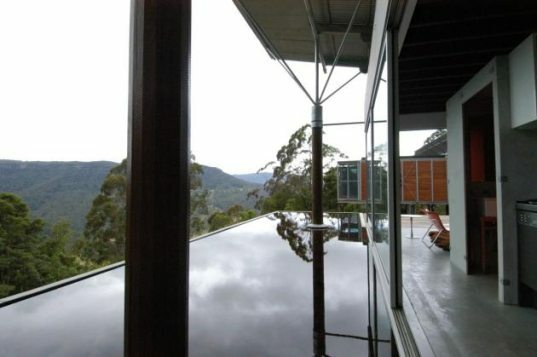 Situated amidst 100 acres of scenic views, rainforest, and flowing water, this gorgeous solar-powered residence stands perched above Australia‘s Kangaroo Valley. Faced with an incredible natural site, Tom White and Alexander Michael’s home incorporates simple, robust materials while practically floats among the clouds. 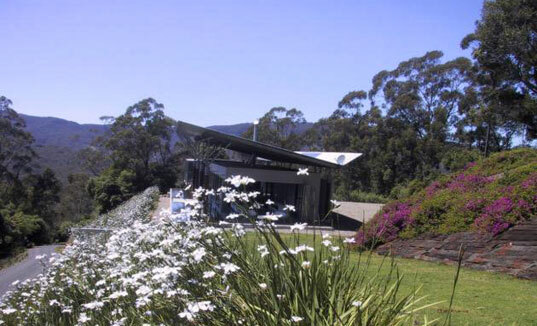 Located in two hours south of Sydney, the Kangaroo Valley house is twenty meters long and 7 meters wide. It was built out of simple readily available materials (concrete, steel, glass and timber), not so much because the builders wished to make a statement, but for practical reasons. In order to get to the site the construction crew had to drive along a precarious winding path, so the project’s robust form and straightforward assembly was a boon. The house is divided into a living area and two individual bedrooms. The living area takes the form of a simple rectangular square with one solid wall and retractable glass all around. The single-span composite timber beams support the photovoltaic-laden roof, which is angled into a V-shape to improve the efficiency of the building. The butterfly-shaped roof also acts as as a sunshade and shelter while serving to support the building underneath. A lovely pond rounds out the project, which strives to strike a harmonious balance with its site. this is cool looking ! Situated amidst 100 acres of scenic views, rainforest, and flowing water, this gorgeous solar-powered residence stands perched above Australia's Kangaroo Valley. Faced with an incredible natural site, Tom White and Alexander Michael's home incorporates simple, robust materials while practically floats among the clouds.